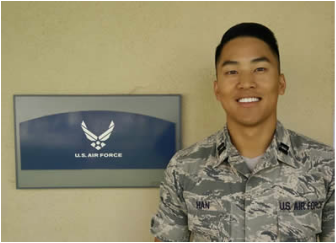 Captain Daniel M. Han is the Operations and Recruiting Flight Commander for Detachment 002 out of California State University, San Bernardino (CSUSB). His job consists of training and overseeing the training of the cadets while reaching out to hometown universities and cross-town universities, as well as high schools within the Inland Empire. At CSUSB he holds briefings on Tuesday for recruits and fields emails and calls from would-be cadets. Capt Han obtained his Bachelor's of Science (BS) in Management at the United States Air Force Academy (USAFA) in 2011. His Air Force Specialty Code (AFSC) is 63AX; Acquisitions management. His first assignment was at Hanscom Air Force Base (AFB) in Masachusetts where he led a large team of airmen as the program manager for Battlefield Airborne Communications Node Operational Improvement. It was commonly referred to as BACN. This project involved putting cameras on Global Hawks and modified Learjets that feed streams of various data that these remotely piloted aircraft (RPAs) collect. Over the course of three-and-a-half years, Capt Han brought down the amount of development software errors by 93%. After the successful completion of BACN, Capt Han moved straight to another project as the program manager for the Distributed Common Ground and Surface System Integrated Backbone, which was a slew of changes to the intelligence database used throughout the entire Air Force. After completing this project, Capt Han volunteered to work at an Air Force Reserve Officer Training Corps (AFROTC) Detachment, and was assigned to Detachment 002.